The morning was filled with the long boring drive through northern Nevada. The most interesting part was the Bonneville salt flats once we hit Utah. The place feels a little surreal. Our first destination in Utah was Provo. Based on some recommendations and reading, we decided to get a real campsite at Utah Lake State Park. 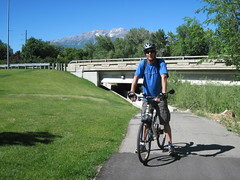 There is a bike trail that starts there and follows the Provo River through town and up the Provo Canyon. The afternoon gave us enough time to ride through town and back. We didn’t have the energy to tackle the canyon. The trail was shaded almost the whole way, so it was pleasant riding despite the 90 degree heat. After supper at a local Mexican restaurant, we drove up the canyon to Bridal Veil Falls and Sundance resort. Sundance was very unique and not what we expected – small scale and rustic though still ritzy. It was fairly cool up at Sundance, compared to the heat and mosquitoes of our campsite.